Well at least Prince showed his face on Night 2 of the three-day HitNRun International Dance Party at Paisley Park on Saturday night. Three times he teased more than 1,000 people at his studio complex in Chanhassen. First, he walked onstage in the middle of Liv Warfield’s set in the NPG Music Club and waved a towel at her to cool her off before making a hasty exit stage right. Then, after watching Warfield’s set from his stairwell perch, he snuck back onstage and played guitar – for maybe 90 seconds with his back to the audience – in the middle of one of Warfield’s tunes. 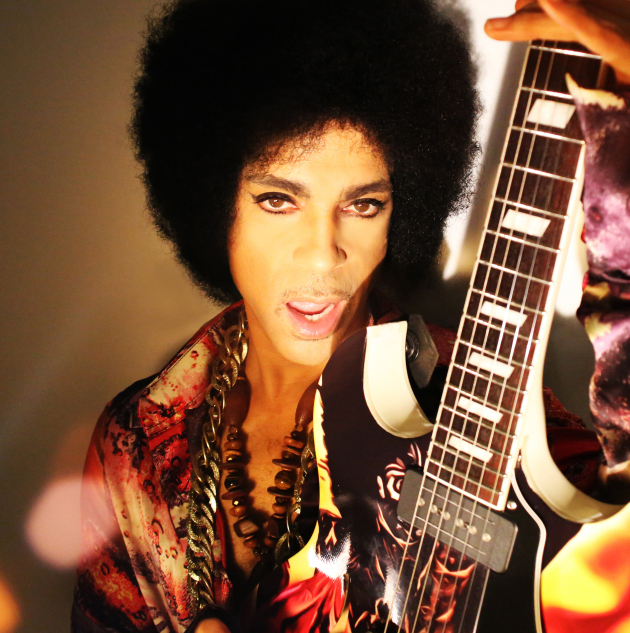 Did the fans want more from Prince as he’s about to release his new “HitNRun” album on Monday? Of course. What more did he give them? Well, after Warfield’s set, the action shifted to the next room, the soundstage, at Paisley. DJ Kiss had been spinning music there all night and Prince and 3rdEyeGirl joined the DJ onstage. Guitarist Donna Grantis walked to the front of the stage to wave to the adoring fans and Prince, wearing a long-sleeve white T-shirt and white pants, crept up behind her and held his hand over her head as if to encourage applause like at a talent contest. Then he stepped back and started running to the front of the stage as if he were going to stage dive…. but he stopped. We’re guessing he didn’t want to damage his sunglasses by jumping into the crowd. Instead, he disappeared into an off-limits area of Paisley. But DJ Kiss continued to spin music for another 50 minutes – until 2:50 a.m.
Saturday’s crowd was bigger than Friday’s. Because Prince announced this celebration on Wednesday, fans were able to come in from Philadelphia, Dallas, Chicago, Louisville and Ottawa, among other places. And it appeared to be one of the younger crowds to show up at Prince’s complex. There was even a dude wearing a Black Sabbath T-shirt, which may have been a first at Paisley Park. The first band to play Saturday was LP Music, a Twin Cities funk-jazz instrumental combo featuring former Prince associates Eric Leeds on saxophone and Paul Peterson on bass. Then Warfield and her group took the stage about 12:35 a.m.
Warfield, one of the best gospel-reared funk-rock singers you’ve never heard, was in terrific voice. She sang with ferocious intensity and heavenly scats. However, she seldom did full versions of songs. She’d typically do maybe a verse and then keep riffing on the choruses. It often felt more like a jam than a concert. A few times Warfield, a former Prince backup singer, challenged the crowd to show more enthusiasm. “Cleopatra Jones,” she playfully responded before announcing her real name. Warfield did covers of Al Green’s “Love and Happiness” and Buddy Miles’ “Them Changes” as well as tunes from her 2014 album “The Unexpected,” for which Prince served as executive producer. Her backup singers did a funked up version of “Crazy,” the Gnarls Barkley tune. On Friday, Prince didn’t appear during the festivities, which went from 9:30 p.m. to 2:10 a.m. Well, he did record a phoned-in message played to people who paid $20 for a tour of his two recording studios. The same tours – with the same taped phone call – took place on Saturday. What’s in store for Sunday? Will Paisley Parkers get to hear “HitNRun” at 12:01 a.m.? That’s when it will be officially released on the Tidal streaming service. You just never know with a Purple party.